Shopping Galore: "Twin Town" in Brazil--created by Nazi doctor Josef Mengele? "Twin Town" in Brazil--created by Nazi doctor Josef Mengele? Was the "Twin Town" created by Nazi Angel of Death Dr. Josef Mengele? Candido Godoi is a very small town in Brazil, only having one mile and a half square mile of land area. 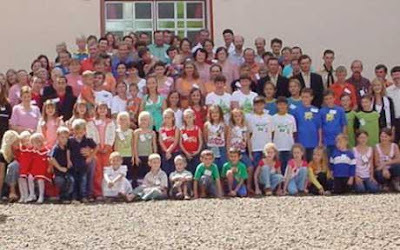 Only 80 families live in Candido Godoi, and in those 80 families, they have produced 38 pairs of twins! "Twin Town", this is what people call the town of Candido Godoi. A town of German-speaking 'Brazilians'. The question is: Why are there so many pairs of twins in this town? Is this really because of the Nazi doctor, also known as "The Angel of Death", Josef Mengele? For those who doesn't know Dr. Josef Mengele,he is a Nazi doctor whose mission was to create a master race fit for the Third Reich, was the resident medic at Auschwitz from May 1943 until his flight in the face of the Red Army advance in January 1945. His task was to artificially increase the Aryan birthrate for his master, Adolf Hitler. He went into hiding in 1960's and resided in Brazil. He is said to pose as the veterinarian, Rudolph Weiss, but attended not only to animals but to women as well. Offering cures for varicose veins and dental problems. Testimonials stated that Dr. Josef Mengele (or Rudolph Weiss) also attended women in their pregnancies, and treated them with new types of medications. He was said to collect blood from his patients. Some say that the "Twin Town" of Brazil was due to the water from the spring. But many believe that Dr. Josef Mengele succeeded in his dream of creating a master race of blond haired, blue eyed Aryans.